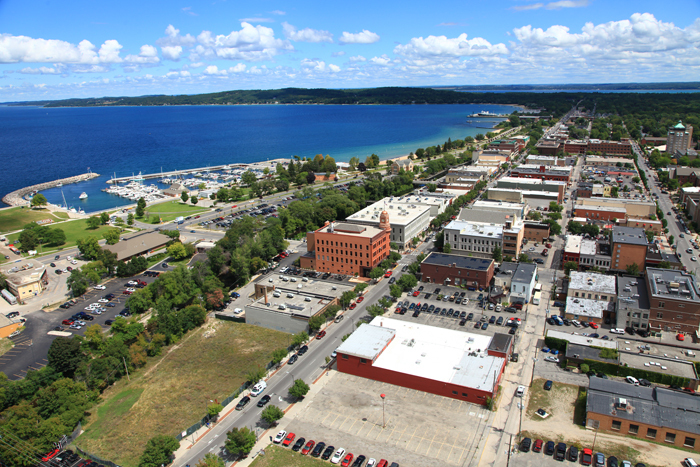 Aerial photograph of Traverse City, Michigan, taken facing east towards downtown Traverse City overlooking Front Street and State Street. This photo was taken on the afternoon of Wednesday, August 14, 2013. To the left along the bay is Clinch Park. The Park Place Hotel, which is the tallest building in Traverse City, is on the far right in the distance (with the mint green roof top).